This continuation of Jane Eyre's tale was anything but wordy and cumbersome. It was such a great read! It read Old English in some ways, without the hard to read language. I had the definite feel for the time period without being bogged down in wording. I was captivated from the beginning and loved Jane's character! I think Joanna must have kept to the similar character of Jane from the Classic as she was very humble and likeable but not afraid to make her thoughts known. This was a great mystery as Jane has to embark on a journey to find out how Adele is doing in this boarding school with the new head mistress. Things are definitely awry when Jane first gets there and they are bringing out a dead schoolgirl! Thankfully it wasn't Adele, but she wasn't in all that better of shape having been drugged up for being over dramatic. I love how Jane jumps in there to try to solve the dilemia! I am definitely going to be reading more books by this author, this was my first and I am excited to read more of her work! Enter to win a copy of Death of a Schoolgirl! Leave me a comment about what classic story you would like to see remade into a cozy mystery. Make sure you leave your name and email so I can get a hold of you if you win!! Thanks so much for having me, Melanie. I did try to keep my Jane as close to the character in Bronte's original as possible. Thanks for noticing! Death of a Schoolgirl has been on my WishList for awhile!! This book has been on my wish list since I first heard about it. Lovely book 'report'. You make this story seem interesting, yet approachable. I say this because I've never read the original Jane Eyre. 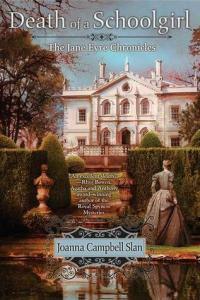 I have read Joanna Campbell Slan books and love them. Kiki is a favorite cozy mystery character. Beautiful review. Book sounds great. I've always loved the book "Little Women". I would love to see if it could be written as a cozy mystery. Thank you for the opportunity to participate in your giveaway. Please enter my name in the giveaway. I have wanted to read this for awhile! The book "To Kill a Mockingbird" was a profound read for me when I was a young girl. I felt a kinship with the character of Scout and would love to read a cozy mystery based off of a grown-up Scout. I would love to see some classic mysteries modernized into cozies. I would like to see The Scarlet Pimpernel made into a cozy mystery! You had a great idea to continue the story of Jane Eyre. You have breathed new life into a tale that many were forced--through a school assignment--to read in the first place! Sounds interesting. I like that she didn't use hard language and followed the story. I wonder if she thought it was hard to continue such a well-known classic. oh I hope the prize includes the book, I so want to read it. I would love to see Little Women as a mystery. I can see Jo now charging off to save the day. Sherry, I certainly found it challenging to continue Bronte's book. The research was daunting. Most of all, I wanted to be respectful of the classic. I hope I succeeded. Id like to see Gone with The Wind remade or Imitation of Life. Great review....this sounds like my cup of tea. I will check it out. This looks like something i would enjoy. thanks for sharing! My mom wants to read this and now that I have read the review, I definitely want to read it too. Thank you! A new author for me. I am ordering "School Girl" from the library so when my prize copy comes I will be ready for it! I agree with two previous commenters - The Little Women Detective Agency should be your next series based on a classic novel. Looking forward to getting to read this! I think Laura Ingalls was inquisitive enough to warrant a mystery series too! Thanks for the chance to win!